In 1993, Alaskan artist and paleo-shark enthusiast Ray Troll stumbled upon the weirdest fossil he had ever seen--a platter-sized spiral of tightly wound shark teeth. This chance encounter in the basement of the Natural History Museum of Los Angeles County sparked Troll's obsession with Helicoprion, a mysterious monster from deep time. In 2010, tattooed undergraduate student and returning Iraq War veteran Jesse Pruitt became seriously smitten with a Helicoprion fossil in a museum basement in Idaho. These two bizarre-shark disciples found each other, and an unconventional band of collaborators grew serendipitously around them, determined to solve the puzzle of the mysterious tooth whorl once and for all. Helicoprion was a Paleozoic chondrichthyan about the size of a modern great white shark, with a circular saw of teeth centered in its lower jaw--a feature unseen in the shark world before or since. For some ten million years, long before the Age of Dinosaurs, Helicoprion patrolled the shallow seas around the supercontinent Pangaea as the apex predator of its time. Just a few tumultuous years after Pruitt and Troll met, imagination, passion, scientific process, and state-of-the-art technology merged into an unstoppable force that reanimated the remarkable creature--and made important new discoveries. 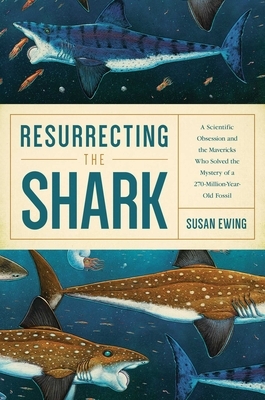 In this groundbreaking book, Susan Ewing reveals these revolutionary insights into what Helicoprion looked like and how the tooth whorl functioned--pushing this dazzling and awe-inspiring beast into the spotlight of modern science.